Synopsis : Details discovered that will help researchers better understand the biological bases for Alzheimer's disease and dementia in older populations. In a comprehensive analysis of samples from 107 aged human brains, researchers at the Allen Institute for Brain Science, UW Medicine and Kaiser Permanente Washington Health Research Institute have discovered details that will help researchers better understand the biological bases for Alzheimer's disease and dementia in older populations. The analysis also highlights surprising variability in the aged brain, including examples of donors with resilience to pathology. The research is published this month in the journal eLife, and the data underlying the research are publicly available as part of the suite of open data resources at the Allen Brain Atlas portal. "Since the population of individuals over 90 years of age is rapidly increasing, understanding both healthy aging and age-related disease is essential," says Ed Lein, Investigator at the Allen Institute for Brain Science. "This means we must discover how cognitive decline correlates with the brain pathologies we typically attribute to diseases like Alzheimer's in aged brains, as well as the biology underlying individual vulnerability and resilience to disease." In this analysis, researchers sought to understand whether associations previously identified between cognitive status, gene expression and brain pathologies - such as the plaques and tangles typically found in Alzheimer's disease - held true in a well characterized, aged population. To achieve this goal, researchers developed a state of the art approach combining traditional and quantitative measures to probe the relationships between gene expression and age-related neurodegeneration. 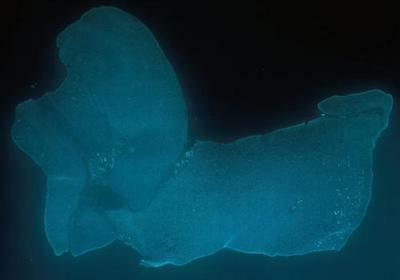 This is a Thioflavin-S staining of a brain tissue sample from the Aging, Dementia and TBI study. Staining reveals amyloid plaques and neurofibrillary tangles associated with Alzheimer's disease (Allen Institute for Brain Science). "Several studies exist that compare expression in donor brains aged 60-85 years, but few in the more aged cohort we were able to study here," says Jeremy Miller, Ph.D., Senior Scientist I at the Allen Institute for Brain Science and lead author on the publication. "We found that the more aged brains still showed a correlation between cognitive decline and the Alzheimer's-associated plaques and tangles, although the relationship was not as strong as in younger cohorts." In addition, the research revealed a surprising relationship between dementia and decreased quality of RNA - a key player in gene expression - in the more aged brain. "One factor that is not always taken into account when studying gene expression in the aged brain is the quality of the genetic material itself," says Miller. "This variable is not necessarily related to any specific pathology or disease, but these results highlight the importance of properly controlling for RNA quality when studying the aged brain and indicate that degradation of genetic material may be an underappreciated feature of neurodegeneration or dementia." All of the data underlying the research is part of the Aging, Dementia and TBI resource, freely available through the Allen Brain Atlas data portal. "We want to promote a model of systematic, collaborative, multidimensional study of the diseased brain and open access to data and tools to facilitate discovery across the entire basic and biomedical research community," says Lein. "We anticipate that this dataset and research model will inform and help shape future brain aging research to propel a deeper understanding of the mechanisms driving neurological disease for improved diagnostic approaches and effective therapeutic strategies," says C. Dirk Keene, M.D., Ph.D., study co-author and Director of UW Medicine Neuropathology. "This collaboration with the Allen Institute for Brain Science has allowed us to gain insights never before possible into the relationships between neuropathology, gene expression, RNA quality, and clinical features tracked in the ACT study over more than 20 years," says Larson, who has led the National Institute of Aging-supported study from its start in 1986 and is Vice President for Research and Health Care Innovation at Kaiser Permanente Washington. "We are grateful to the thousands of volunteer subjects who worked with us and those who donated their brains to science. The results are transformative in improving our understanding of the aging brain, a theme of the ACT study, which aims to learn ways to reduce the burden of dementia for individuals and society overall."